If you read my blog for some time, You probably have noticed that I really like Wolsung skirmish game. 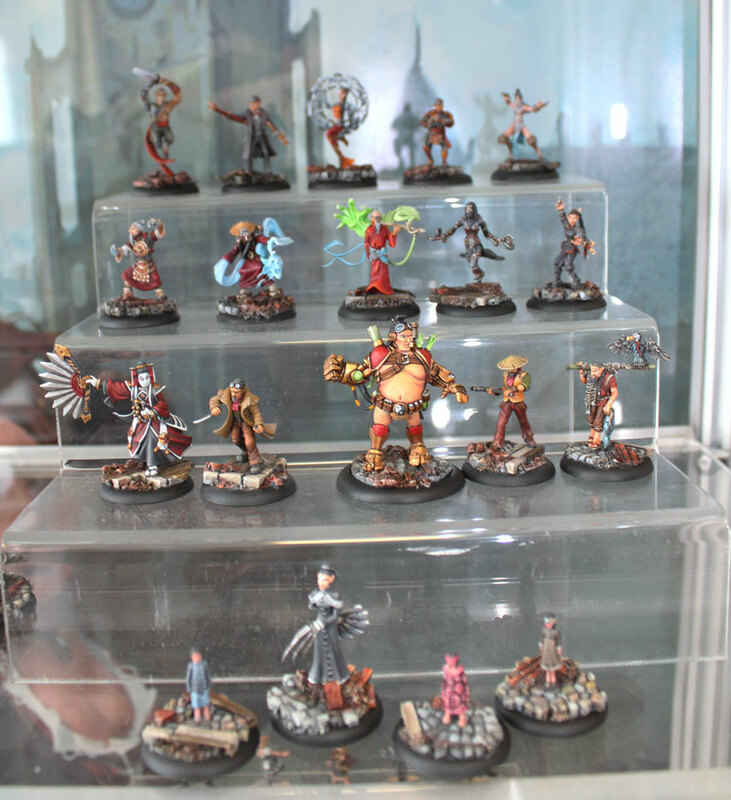 I really like models and the fluff – for me it is a proper steampunk game. The game I was looking for quite some time. Few weeks ago I had a pleasure to visit HQ of Micro Art Studio in Gdynia, Poland- producer of Wolsung game. I have played nice game with Łukasz Perzanowski, one of creators of Wolsung. I got short tour around the place and what is most important I had the opportunity to talk with Sebastian Makowski – boss of Micro Art Studio. Big thank you for that! 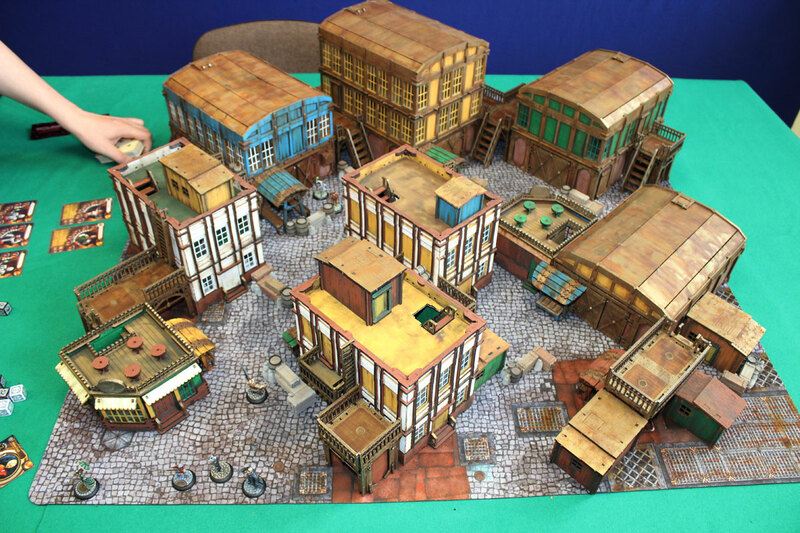 Now is the time for the last part of material I brought back from Gdynia – interview with Łukasz – the guy who was making the rules for Wolsung Steampunk Skirmish game. Have a read! Me: How exactly Wolsung Skirmish Game was born? Łukasz: It all has started in 2011… I think… or little bit earlier. Sebastian Makowski, the boss of Micro Art Studio simply thrown the idea of releasing his own miniature game. We, Micro Art Studio crew, are quite experienced players, so it was not a big problem to develop our own set of rules for the game. All was needed – the miniatures. During that time, we already have produced Discworld miniatures, but license agreement hasn’t allowed us to make a game based on them (it’s quite limited license). Terry Pratchett’s agent was little bit reluctant to extend the terms – he just didn’t want to make competition to existing games based on Discworld series. Me: So you were needed some different idea for the game? Łukasz: Exactly. We needed something else. Our idea was to start the skirmish game with only handful number of models essential for play. Besides that, as we’re the company producing game accessories – we wanted the game with so called “full package” we could handle here in Micro Art Studio, and many skirmish games lack – terrains, bases, battle mats. 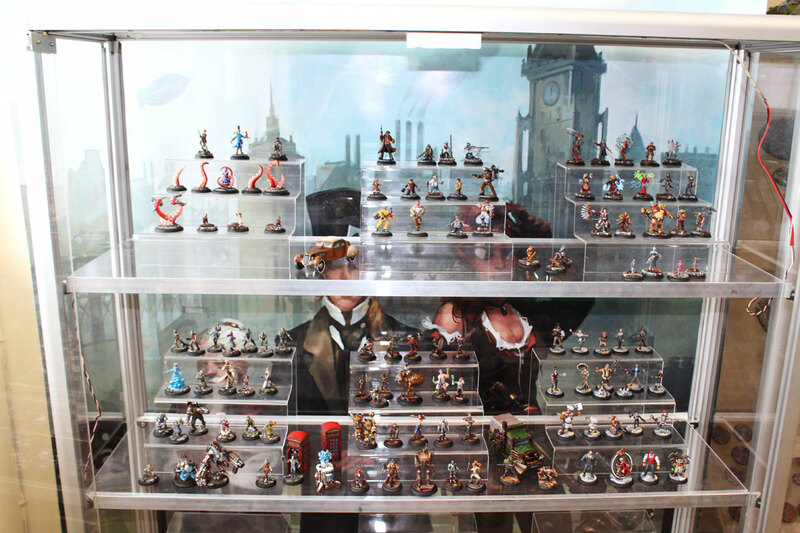 We were able to do that – so the game itself could have not only nice playable miniatures but all besides that. As for miniatures, we had some experience with the production, so all that’s left was to develop cool rules, and that was the task we got from Sebastian. Me, Jan Cieślicki i Wojtek Chroboczynski in 2011 were working on basic rule set, and separately each of us were thinking about one of the factions and rules for them. I was assigned to develop Ash & Oak faction, Wojtek was working on Triad of Lotus Dragon, and Janek on The Inventors. The Wolsung Steampunk Skirmish Game was slowly become reality. Me: How long development process and the tests lasted? Łukasz: We were working and testing the game whole year. Once a week we had a meetings, when we did ‘brain storm’, work on the most accurate rules to balance the game and play test games. Now, after all tests, and all the trials I’m pretty sure that the rules we have created are well balanced and the game runs smoothly. Of course, there could be some slight flaws. After all, there were only three of us, and after these tests some inaccuracies have appeared, but they are already corrected in first expansion. Me: You mean The Expansion form Kickstarter campaign? Łukasz: Yes. There is errata in this expansion already. Some rules were corrected – amendments to the rule book, but also there are new rules for all the models from Kickstarter campaign. The run of first rule book edition is almost out, and we should publish second, corrected edition within one year. This is very important for us – some rules are need to be set straight. For example – in first edition rule book, players were not allowed to measure the distance on the battlefield, but now we have changed it – the game itself became faster and more tactical. Me: OK. In 2011 you have started with skirmish game, but before there was Wolsung Role Playing Game. How is it connected to Wolsung Skirmish Game? Me: Ok, but how did you get the idea to locate the game in Wolsung world from Role Playing Game? 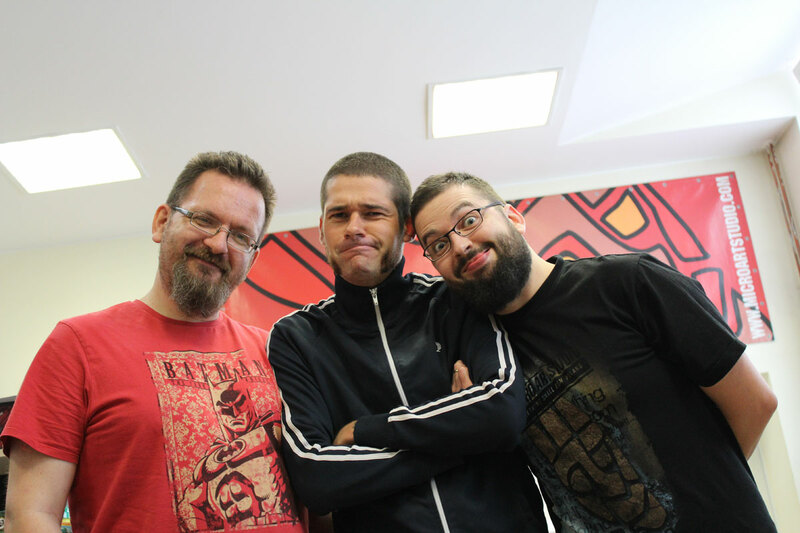 Łukasz: We are good friends with folks from ‘Kuźnia Gier’ – the publisher of Wolsung RPG. On one of the game conventions, Sebastian Makowski was talking with Michał Stachyra, the boss of ‘Kuźnia Gier‘ (English: Games Forge), about possibility of getting Wolsung license for miniature game. There was absolutely no problem with that, so here we have Wolsung Skirmish Game, based on the role playing game’s setting and fluff. Some of characters from skirmish game were taken from RPG, but most of them are our inventions. As for the game – RPG’s rules are very interesting – the combat is minimal there. There are no such thing like turns of combat and cards are very important part of the gameplay (this the element kind of represent the spirit of XIX century – when cards gambling clubs were very popular and also as a theme of spinning the wheel of fortune), – all archetypes of heroes and their special skills were based on common playing cards. We implemented this element to our game – but we have focused more at using cards in the combat. We also changed D10 dice to more popular D6. Me: Skirmish game is based in Lyonesse? Is this city present in RPG? Łukasz: Yes, It’s capital city of Alfheim Empire. It’s equivalent of London, even though the name of Lyonesse sounds lore French than English. The France is called Aquitaine. Me: Are there any ideas for factions from Slavia? Me: There are three basic factions and two from the expansion. Few words about them? Łukasz: First – Ash and Oak – club of noble men and women of Lyonesse protecting order in the city, second – The Inventors – bunch of engineers and scientists, and third one – Triad of Lotus Dragon – far east underground organization. 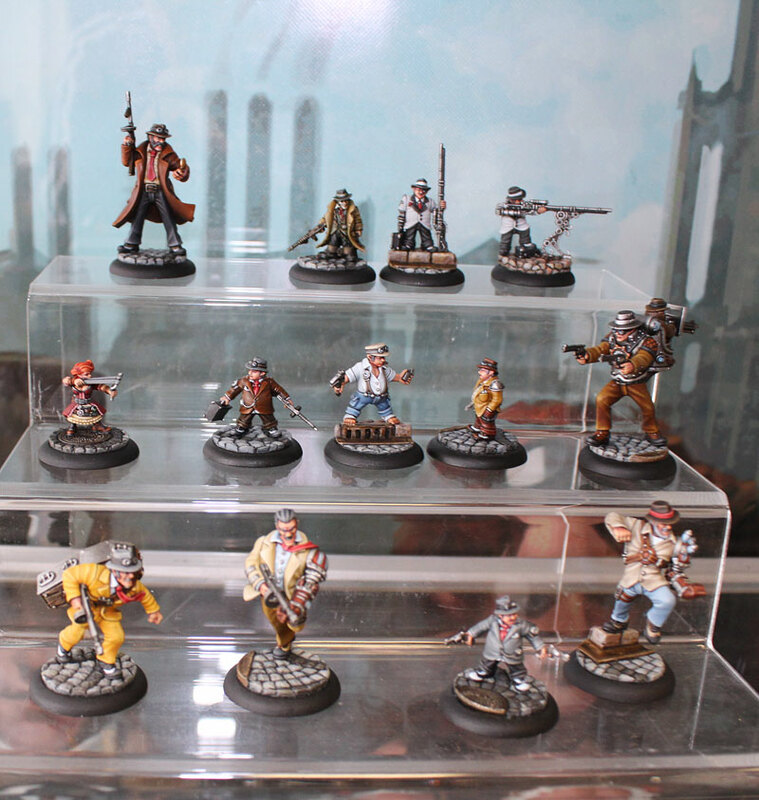 In the expansion we have two more factions – Scylla – Halfling gangsters and Van Rier – undead agents of Wotany . Łukasz: At the moment – Van Rier. Not because Van Rier are easy to play. Quite opposite. I like them mostly because I was developing the rules for them. Although the ideas for Van Rier heroes were from Piotr Kupper. Łukasz: Sure, but we had to start from something . 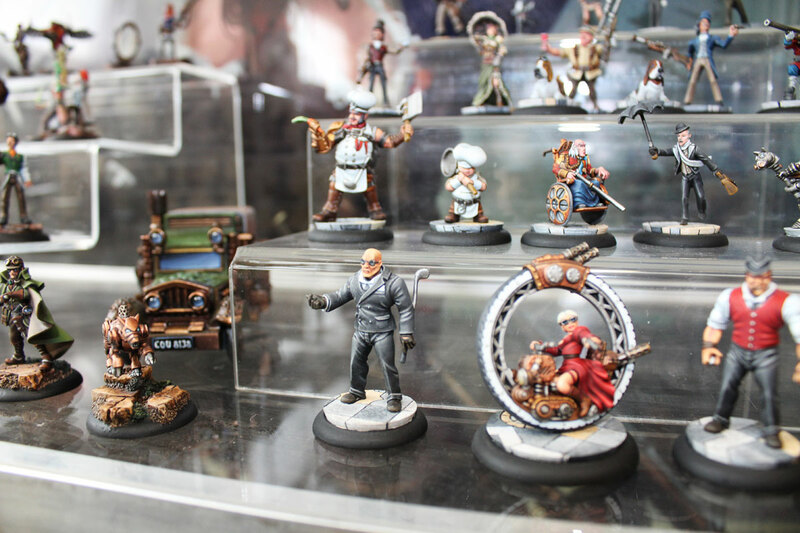 The case was, we wanted to release a handful of miniatures that would be playable and from that point we could develop the game – add new factions, models and rules. At the moment we decided to start with Wolsung, there were some disturbs inside the company, and because of that we had some delays, but right now our offer expands. Me: Wolsung was planned as Kickstarter campaign from the start? Łukasz: Not entirely. 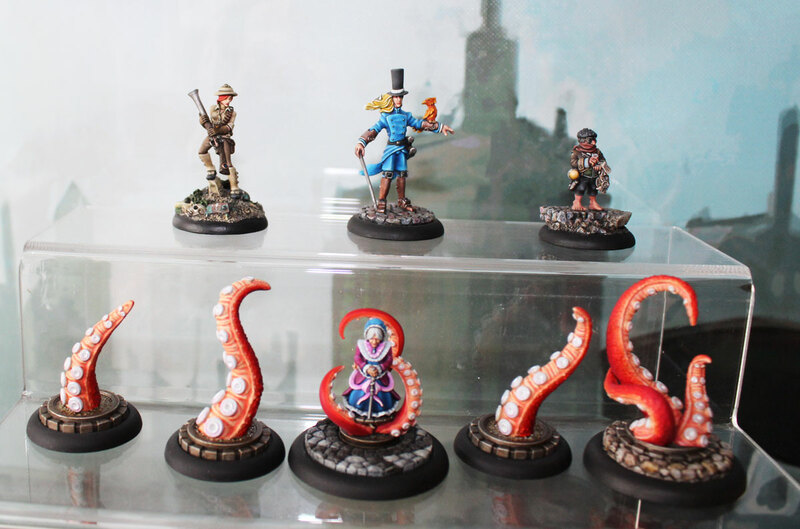 Miniatures were designed and published with the idea of put them in our store offer at first with no game mechanics. The rules were prepared in the meantime. Our first campaign launched on Indiegogo were only to fund the rule book. That was the idea. We raised triple money we needed . And our second campaign – on Kickstarter this time – was launched to fund new factions, additional models and rules to them. We don’t have the plans to start another crowdfunding campaign – Wolsung will be the game with our full support from now on. It’s going to evolve and expand. Now, all the backers from the campaigns (only on Kickstarter we had around 600 backers) is our base of fans. We know Wolsung is catchy and it attracts gamers attention, and we are sure, there are some people out there who are willing to buy Wolsung products. So, all expansions or new models and factions will be released simultaneously and little by little game will grow. Me: Which faction is most popular? Łukasz: On Kickstarter – Scylla. Also Van Rier is quite popular. And from the factions already in the offer – it’s hard to tale. I think Triad of Lotus Dragon was selling little bit worse than the rest of the range, but I think the miniatures sculpts were not dynamic enough. New wave have way better sculpts and they are more interesting. Me: Ok. So you have new factions and some new miniatures. And how about battlemats and scenery elements? 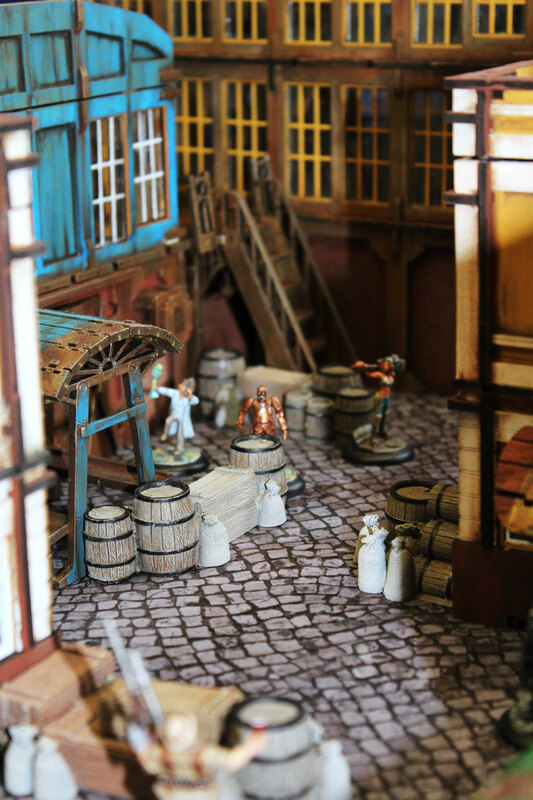 To start the game you will need buildings from XIX century and specific mats – and these are not common products, like SF or Fantasy scenery. Łukasz: At the moment we have some municipal buildings, warehouses, walkways plus some small elements. Soon we will add shanty town and pizzeria (this will be HQ of Scylla). And the battlemat of course. It will be available this summer. We are finishing to ship all the stuff to Kickstarter backers, and right after that all new products will go to open sale. Generally we don’t have to expand our HDF buildings offer, but planning to make smaller scenography elements from foam. Me: Speaking of material. Why you are decided to make your miniatures from metal? Are they cheaper to produce? Łukasz: The thing is, we don’t owe the technology to manufacture the miniatures, and for the long time there were no possibility to cast models from resin. New factions are partially made of metal and resin, but we started from metal, because there was no other way – resin was unavailable and plastic was too expensive to use. Metal was the only option to cast miniatures in quality we wanted. We cast them in England. To be honest, it’s cheaper to commission the casting process, like to Prodos (they cast our resin products) for example, because they already have invested in machines and workers, and therefore the price is better. Me: And what about promotion? Wolsung is not so popular. Game’s presence on internet forums is minimal. Even if I find some topic about Wolsung – it’s dated to 2013 or something like that. Łukasz: I think Wolsung mostly caught the attention of casual players, who prefer to play at their homes and they don’t have this need to ‘come out’. I have the impression, folks I meet on conventions, or the backers of Kickstarter campaign, they are this kind of players who are looking for another game with accessible rules to play at home with family or close friends. There were some questions about tournaments – and the moment we are not planning to organize anything, but if someone is willing to organize tournament, campaign or any similar event, it’s possible he/she will get our support, but we don’t plan to make a move in that direction. Łukasz: Oh yes, German publisher – all the rules and character cards will be translated to German and shops will supplied with Wolsung with tables, scenery and starters for demonstration games, so there will be possibility to play. The beauty of Wolsung is, that you don’t need that much space, all you need is small table – and it could be fitted almost everywhere. German version of rulebook will be released right before Essen Games Fair – in October 2015. The first expansion will be released little bit later. Me: OK. Big promotion boost, but I presume it’s not only in Germany? Łukasz: Yes of course, and I must say the cooperation with German developer mobilize us to put some even more efforts to Wolsung. We started to plan more stuff. Soon all the products from Kickstarter campaign will be introduced to open sale, and after that we will introduce our latest ideas. We are planning to release three new factions – I can tell about only one – Elven police Force of Lyonesse (Alven Yard). Beside that we will promote the game at conventions, stores and online of course. Soon we will launch You Tube channel with battle reports, tutorials and some extras. We would like to reach our customers and start the conversation – show what we think and ask what they think about Wolsung. Me: are you planning to use Kickstarter again? Łukasz: No. We have launched two crowdfunding campaigns and that’s enough. This second campaign allowed us to increase the number of available models and introduce new factions. Those 3 basic faction were definitely not enough. Right now we have over 100 Wolsung miniatures and this is good start to start promotion campaign in stores. Frankly, everything boils down to that. Stores must have new models almost every month to keep interests of gamers. Me: So, to sum up. 3 new factions. Something more? How are you going to implement new stuff? Łukasz: We are planning to publish one expansion a year. In each new expansion – new faction will be presented plus something new to existing factions. Beside that new expansions will include themed scenarios i.e. Jungle Trip or solving some criminal mysteries in Lyonesse. Some scenarios will be strongly connected to new characters and their special rules. And there will be definitely more fluff ( many people complain about lack of it in rulebook). Me: Sounds super cool. I can’t wait for all of this. Thanks for the interview. Now it’s Mai end of April 2016… when will the german Version be released now? honestly, I do not know. I recommend to ask at Micro Art Studio (website contact form). I only interviewed Łukasz, and I don’t have any insight how Wolsung is at the moment. Previous PostStarting my next project: Neverborn – Lilith Mother of Monsters.